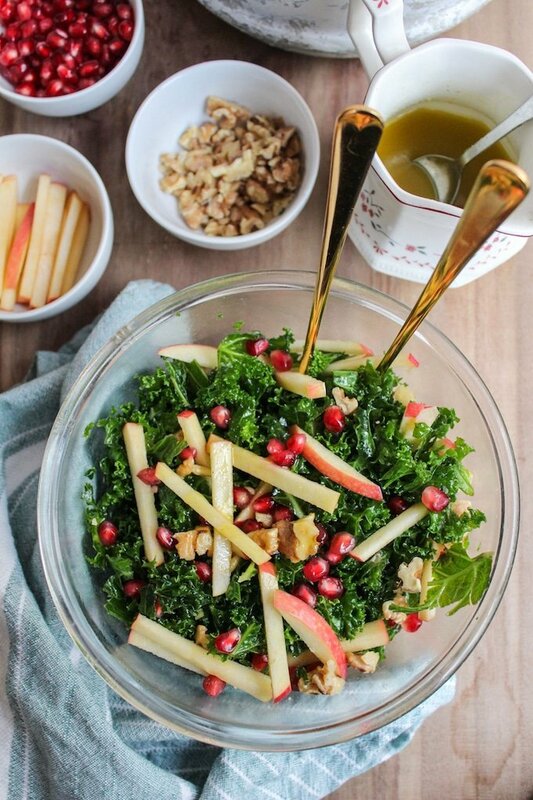 Winter Kale Pomegranate Salad: crisp apples, toasted walnuts, massaged kale and ruby red pomegranate seeds topped in a sweet and tangy honey mustard dressing. I feel like this is something that I say every month, but please just excuse me just one last time (this year) when I say that I can’t believe that it’s already December. I think the craziness and the traveling in the past month is finally catching up to me. Between a weekend trip to Dublin and my two weeks in Arizona visiting family & friends I am completely b e a t. I think I’ve slept most of the past two days trying to get over this jet lag and I’m finally getting over my cold from last week. Who goes to a warmer, sunny climate and catches us cold? This girl, apparently. Between the jet lag, the constant sneezing, and wanting something light and healthy to make up for the Christmas Baking Bonanza that is about to ensue, I needed something green in my life. 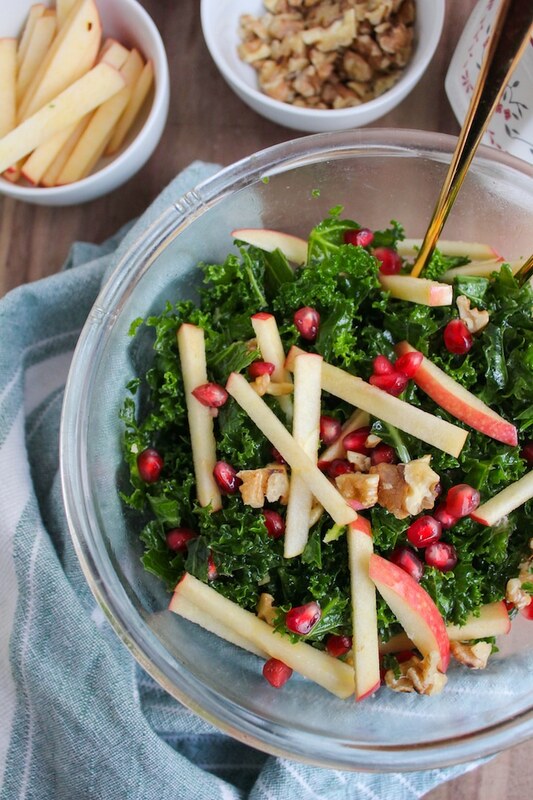 Enter Scene: this Kale Pomegranate Salad. Helloooooo antioxidants. And hey, even better it’s green and red. Festive, right? This worked out pretty well actually because I’ve been wanting to eat/cook with pomegranates more in general since they’re one of the healthiest fruits out there, but I just didn’t know where to start. When in doubt, just throw it into a salad. And don’t forget about the honey mustard dressing! Sharp. Sweet. Oh, so perfect. This recipe is fast and easy if you want something in a pinch. Throw in left over quinoa, rice, avocado chunks, or some crumbled feta if you want to bulk it out a little more. I actually had this salad topped with a hard boiled egg and a bit of halloumi for the best breakfast this morning and it was so good I’m probably going to have it again for dinner. I have a feeling this is going to be something of a staple these next few weeks as we get through the upcoming holidays. Extra salad = extra cookies, yes? Prepare the kale by cutting out and discarding the tough ribs. 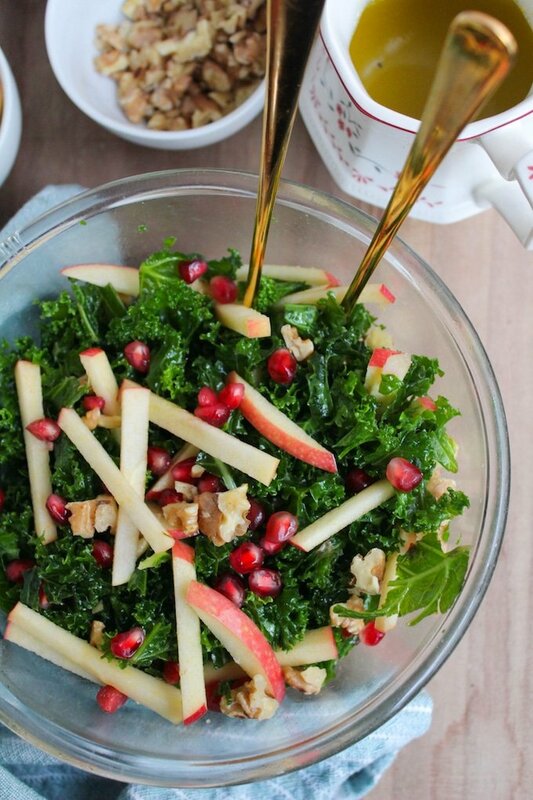 Thinly slice the kale into ribbons and add to a large bowl. Add 1-2 tablespoons of olive oil to the bowl and gently massage the kale between your fingers for a minute or two until it becomes soft. This helps to take out the bitterness and stiffness of raw kale which makes it easier to eat. Toast the walnuts by heating a large pan on the stove top on a medium-hight heat. Add the walnuts in an even layer and watch/stir constantly until they begin to brown and smell toasted. This should take no more than 5 minutes. Remove from the heat and chop roughly before tossing them into the salad. 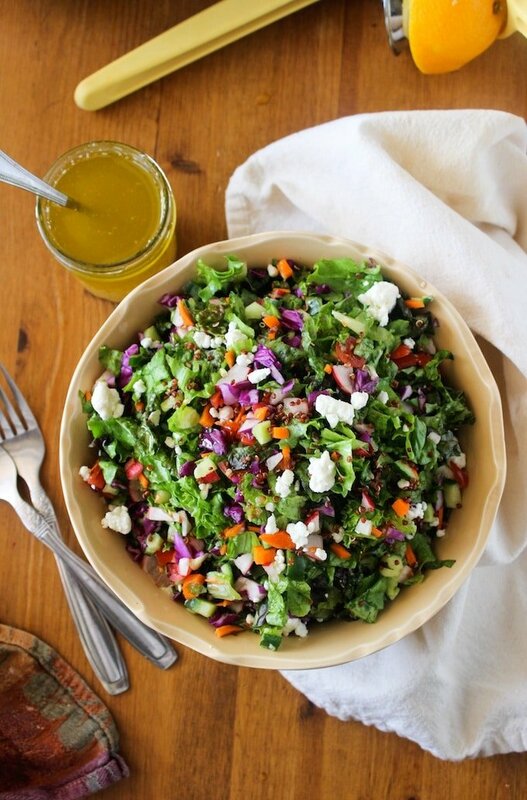 Make the dressing by adding all the ingredients to a small cup or bowl and whisking until it becomes emulsified. Taste and season with salt and pepper if needed. Thanks, Helen! Hope you have a great week! That’s one beautiful salad! Everything about it sounds delicious! 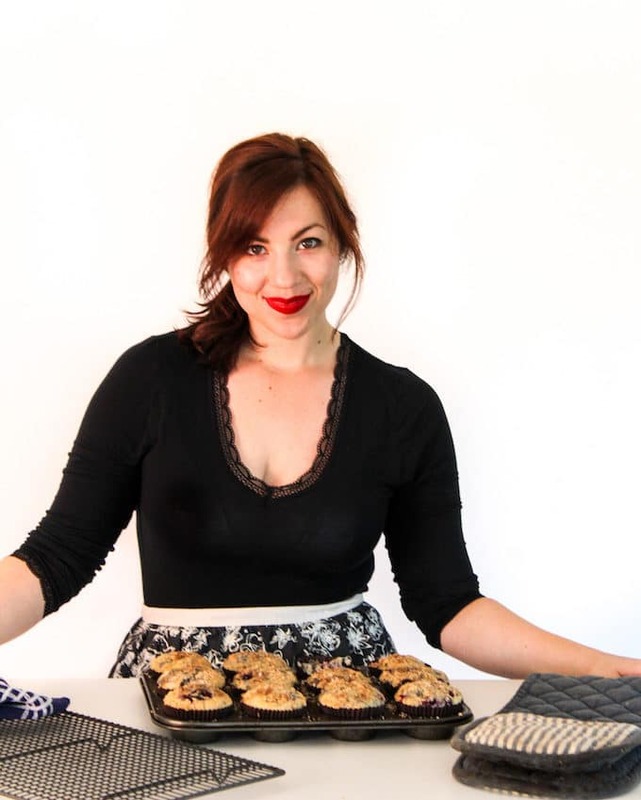 Thanks so much for sharing it at Savoring Saturdays! MMMMM. Nice touch with the apple cider vinegar! And I love love love kale. I just happily remembered I have some in the fridge. Hello, lunch. Thanks for linking up at #SaucySaturdays. 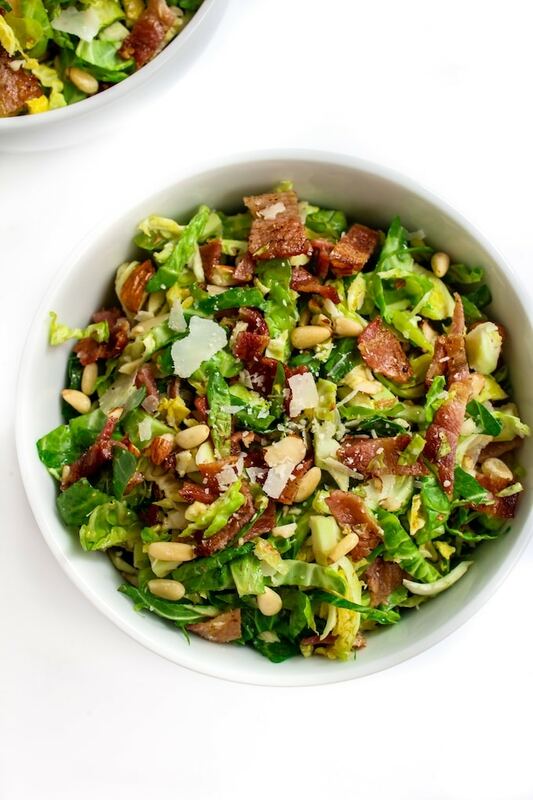 What a gorgeous salad and perfect for Christmas too! 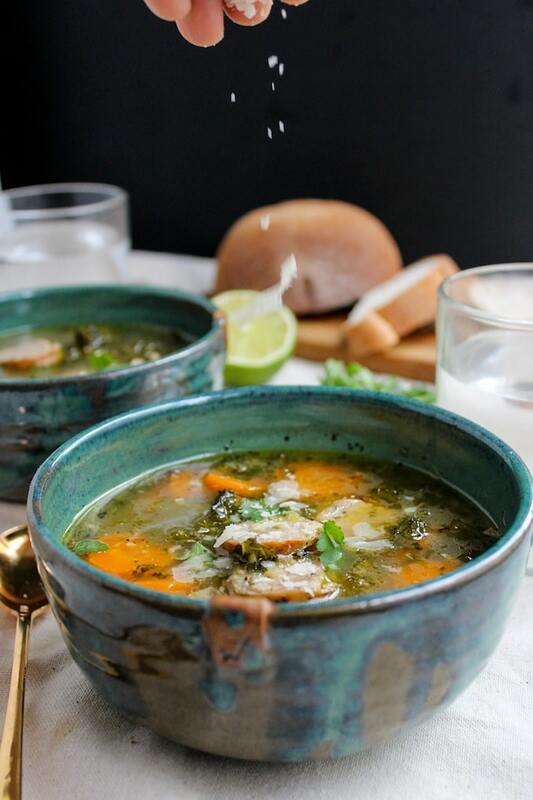 Thanks for linking up with us for Fabulous Foodie Fridays, have a great weekend. Thanks, Lauren! Hope you have a great weekend too!